Rev. 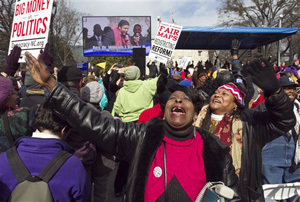 Jerry Dowdy of Carthage, N.C. sings with thousands of others at the "Moral March on Raleigh" on Fayetteville Street in Raleigh on Saturday, Feb. 8, 2014. Nearly 200 organizations are joining the National Association for the Advancement of Colored People in the "Moral March on Raleigh," a new name for the "Historic Thousands on Jones Street," as it was originally called. Jones Street referred to the street where the Legislative Building stands and the usual terminus of the march. Photo Credit: The Associated Press, The News & Observer, Robert Willett. Following a year marked by hundreds of arrests and national publicity but few policy victories, leaders of the movement opposing the Republican agenda in North Carolina vowed Saturday to keep fighting and to speak clearly at the ballot box in 2014. 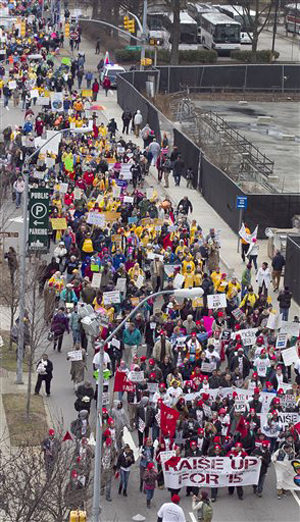 Thousands of people angry with GOP policies approved in 2013 were energized while attending the "Moral March on Raleigh," the largest gathering of its kind since weekly Monday protests began last spring at the Legislative Building. "We return to Raleigh with a renewed strength and a renewed sense of urgency," the Rev. William Barber, president of the state NAACP shouted to a packed crowd that extended at least three blocks along Fayetteville Street south from the old Capitol building. "This Moral March inaugurates a fresh year of grassroots empowerment, voter education, litigation and nonviolent direct action." Raleigh police didn't give an attendance estimate. Event organizers predicted between 20,000 and 30,000 people would attend when seeking a permit with the city to march from near Shaw University less than a mile. It took more than an hour for the last marchers to reach their destination. There were no reported arrests or disturbances. More than 900 people were arrested during more than a dozen protests during the 2013 legislative session in nonviolent opposition to the GOP agenda. Saturday's event was not intended to include such civil disobedience. Event organizers said people from more than 30 states planned to attend the rally, a reflection of the spread of the "Moral Monday" protests to nearby Southern states. It was a diverse group of rally participants who chanted, sang and danced at the end, waving placards on topics ranging from campaign finance and education funding to gay rights and abortion rights. "Someone can say, 'what can one man or one woman do?" asked Kirkland Carden, 25, a Georgia State University student who traveled with Planned Parenthood organizers to participate. "But when everybody comes here, you get waves like this." The NAACP and like-minded advocacy groups have held similar annual winter marches and rallies for the past seven years demanding changes in North Carolina government, but none received the kind of attention as Saturday's event. Everything changed when the Republican-led General Assembly and Gov. Pat McCrory passed laws last year opponents call extreme and backward. Those laws include a refusal to expand Medicaid to more working people under the federal health care law, a photo identification requirement to vote in person, additional abortion rules, taxpayer-funded grants for low-income children to attend public schools and tax changes critics say hurt the poor. "I mean, this legislature is disgusting," said Susan Stone, 71, of Black Mountain. She left on a bus at 2 a.m. Saturday from Asheville to attend the rally. She held a sign reading, "Why don't you care about the least of these - God does!" Democrats in the General Assembly were largely helpless to stop the laws. McCrory, House Speaker Thom Tillis, Senate leader Phil Berger and allies defended them as promoting a stronger economy, more jobs, better educational opportunities for students in failing public schools and improved confidence in the election system. The National Association for the Advancement of Colored People or other groups and voters have sued to challenge the elections overhaul law, taxpayer-funded education grants and public school teacher tenure changes. The cases are pending. Rep. David Lewis, R-Harnett, said Saturday the NAACP was being hypocritical for directing marchers on a document to bring photo identification when it opposes a photo ID requirement for voting. Lewis helped shepherd a voter ID law through the legislature. The conservative North Carolina Values Coalition criticized the event beforehand, saying it was being spearheaded by groups that support abortion and gay marriage. The Republican General Assembly put on the ballot a constitutional amendment prohibiting gay marriage, which voters approved in 2012. "The so-called 'moral march on Raleigh' is anything but moral," coalition executive director Tami Fitzgerald said in a release. Barber said Saturday it was the "Moral March" movement that had the high ground on supporting equality and justice for all and would keep working against Republican leaders. He said the NAACP would ramp up a voter registration and education effort in all 100 counties this year while continuing to fight bad laws in court. "We will encourage voter turnout regardless of party," Barber told the crowd. Speaking rhetorically to Republican state government leaders, he added later: "You don't have enough political power to vote us away." Attendees, who swayed arm-in-arm while singing "We Shall Overcome" at the rally's close, went away emotional and enthusiastic. "This huge demonstration of unity and commitment to each other, it's a beautiful thing," said East Carolina University student Demonte Alford, 22, of Laurinburg. "We got our marching orders today." i myself am one to not condone giveaways or pity, but i grew up poor so i know what it is like. i recently turned 19 and to the poor that now means no healthcare. since i am only 19 i do not have to means to provide proper healthcare for myself. some do abuse the system, but others genuinely need the help the government is slowly taking away. healthcare coverage use to be until 21. it is issues such as these that fuel the fire of these protesters. its not only the problems that these people face like i have had to, but also the help that they originally received. they want the help that they grew up with because these laws are a choice, a choice they want to fight for. it is a fight they are choosing to fight together and i see nothing wrong with that. Thanks for your insight! I totally agree that there are people who actually need the help of the government. My family went through a time where we certainly did. The challenge then becomes, how do you raise awareness of these issues without making so many people see it as "just another street protest", and help people in prominent situations recognize the REAL need that exists? i realize that it will take a lot of will power and probably money, but i think that each person/family should be evaluated individually. by doing this it ensures that are making up their supposed needs from those who actually demonstrate need. some people take hand out from the government so that they dont have to work. then there is the case of those who are genuinely ill and cannot work. i do not think that people should be solely supported by the government but there is also people who cannot help themselves. they did not choose to be sick and not everyone has a family that can or is willing to support them. I think this is an interesting article because there are two very separate points of view with one reporter saying, "The so-called 'moral march on Raleigh' is anything but moral," and another saying, "This huge demonstration of unity and commitment to each other, it's a beautiful thing." It is difficult to know how to raise awareness of oppression without being in some way contradictory. People will not hear about a protest or a parade unless strong words of truth, and possibly exaggerated signage is used. This seems to be the only way to get the attention of people. However, unfortunately, that attention is often negative by many, as they point out the hypocritical nature of how protestors act. It's hard to know how to instigate change in a positive manner. I agree with you: it is often hard to draw attention to something with creating a wave of negativity. Often something bad has to happen that people start to listen. Then, these people acknowledge that something has to change but unfortunately, this process of change is left to other people. Health care should never be something you have to fight for. It should be eligible for everyone, rich and poor. It is important to care for one's health but therefore appointments at the doctor and treatment are necessary. This, however, costs money and if not covered by health insurance, difficult to cover - if not impossible for some. In other countries like Germany people who cannot afford health insurance do get help from state. There, everyone has to be covered in some way. These people might not be covered for all treatment by the company and have to pay a rest amount but at least they get some help in taking care of their health and their lives. This privilege provided by the state should be adapted by the USA in order to help those you simply lack the financial stability to afford health insurance. There will be always people that will take advantage in one or another way from a social system like that but in the end, the profit for others will be even greater. I am not from US, so I have the same problem with my health Care. I think it is unfair, but I cannot imagine how unfair it is to people who are americans. We are talking about health and It is disgusting to realize that business are within your well-being as well making you pay to cure your diseases. It is very scary to think that if you have not money you may die because you will not recive a good healthcare. United States has money for sure. I am very happy that exist this kind of protest to at least encourage more people to fight for what they own, and also fight for what they pay everyday in taxes. It's crazy to think that all these other countries that are actually succeeding with health care are moving more forward than a country without it. We should look through what works with this through the errors, and achievements of the other countries with this law and find a common ground. It shouldn't be that hard to see if something works or not, it's not like we can't ever go back. What I found very disappointing last year was the fact that Republicans and Democrats were not able to find any kind of agreement concerning Obama Ce so that it had a great impact on the government shutdown last October. I feel like that Obama Care has never given a fair chance to establish because the ones against it picked on the program from its beginning and that way, these people will always see the negative. Health for everyone is working in other countries so why not here in the US? I can only see advantages and the resources are available as well. Thousands of people would profit in the long run and isn't that what a nation should aim for?! I agree with this. Why cant we take advice from others? If something wasn't working in the first place wouldn't you try and fix it? Or if something was good but not great, wouldn't you try and better it? We can always improve on something. When its working its not like you can go back and say we never should have changed anything because there is always room for improvement. Do Public Protests make a Difference? I read this article over a few times before responding, as I wanted to have some more information of why this march was taking place and that weekly protests were held every Monday since last spring. So, I went under the North Carolina legislature sight. I did spend 2 plus hours trying to find the specific bills and what the actual fine print said. As many of us know from voting and elections, there are both sides that have their reasons for and against a bill. I was a bit frustrated as I did not find anything on “tax funded grants for low income children to attend public school” (Robertson). I am sure it is in there, somewhere. Well, back to the point of the article; peaceful protests against state laws. Marches and standing protests I think make an impact. If not on the government body themselves, then on the voters who engage in peaceful protests, to those hearing about the protests, to people just walking/driving by the protests. These protests are just a part of how change at the micro level (individuals) that spreads to the macro level (social groups) that spreads to changing the Institutions of America. Of course each part and each individual are important and do make a difference! I am from Chile. We are a undeveloped country, but we are on their way. We have good economy, but there are plenty of important things to improve over there. Therefore I agree with protests because it is the only way to put goverment under pressure. Since 2008 Chile has been passing through protests of many kinds. The most important one is the fight that people is giving to improve the public education to make a fairer country with the goal to get education of quality for everyone. Many crimes from Protestants, and also from the police are very common within this procces have happened. But, YES! It is working and also good improvements have been done from the goverment. Every country has their own issues and protesting is a good way to achieve better results. However I also believe that those protest must been authorized and with a pacific character. I am glad to hear that people in US are manifesting themselves to get a fairer country and get the rights that everyone has. I am actually for the Health Care availability for everyone and to keep everyone healthy should be our first priority. If the gov has lots of issues that it has to face, then why not take them one step at a time, and not crash, again. We should all work together and help out each other so we can have a stable society. I am for the Health Care. I am for the Health Care. Peoples health should be first priority to the nation but somehow it gets stuck into the back seat. Other countries are succeeding with health care. Why cant we take advice from others? If something wasn't working in the first place wouldn't you try and fix it? Or if something was good but not great, wouldn't you try and better it? There is always room for improvement. you are right. There is a huge need for improvement in this state. This group of Republicans seems to be failing the less fortunate in their community. They need to look at the more successful states and get an idea on how to better accommodate more of their citizens. This is a tough one. I understand the need for a better health care, but why is it the responsibility of the working class to pay for the health care of others? There are many people out there who live off of the government. The government has made it too easy to receive hand-outs and does not have many rules of who can get them. I once saw a guy at the store pay for some alcohol with his EBT card. This does not make sense to me. Why would working taxpayers pay for a person's alcohol? The person is on government assistance to get help with food, shelter, etc. This is why I think there should be more rules and requirements for persons receiving government assistance. It should not be up to people who are working hard to pay for people who are living off of the government. I wish they would look at each applicant on a case-by-case basis and make sure the person/family is really in need before placing them in government assistance. As a politician, your duty is to serve the people as best you can and when you come across people who have expressed that they have been treated unfairly, calling them hypocritical in their actions is not really called for. What you should do is analyze the concern and try to find some common ground that will cover a large portion of the community, keeping the community tranquil. I do not believe that if all these people come out to express that they are being treated unfairly in the form of health and education, the republicans are doing that great of a job. They may just be abusing the power that they have in this state and only helping the people they see fit to help. Healthcare is something I think everyone should have access to, especially is such a prosperous nation.